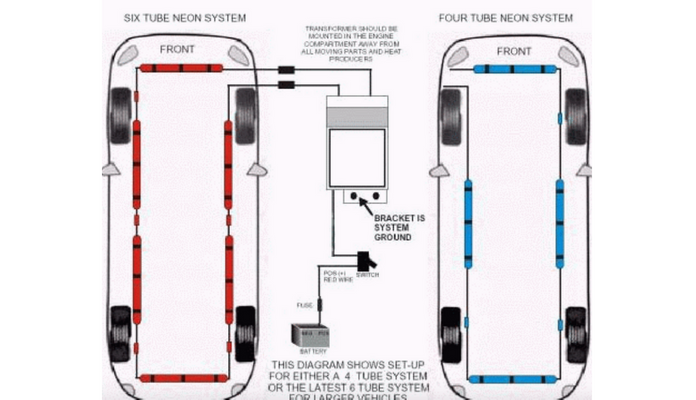 Need help with wiring diagrams? With regards to these diagrams it’s important to note that the black dots represented in the first diagram (see at the bottom of page) means that the wires are connected. For information sake, when a wire is depicted in a diagram that it looks like it’s ‘hopping over’ it means that they’re not connected in real life. To connect a wire as shown in the diagram, you can cut and splice or use 3M Scotchlok connectors that crimp onto the wire to make a connection. Alternatively, you can strip back the insulation and wrap the other wire around it and solder the connection with electrical tape or heat shrink tubing. You can also use wire nuts to secure the connection, crimp caps or terminal strips. These are thanks to PTCruzr!!! (for neons WITHOUT external transformer). NOTE: If using a light up switch connect the 3rd connection on the switch to ground. (for neons WITH external transformer). NOTE: If using a light up switch connect the 3rd connection on the switch to ground. (for kits WITHOUT an external transformer). NOTE: If using a light up switch connect the 3rd connection on the switch to ground. NOTE: If using a light up switch connect the 3rd connection on the switch to ground. Notice the load resistor that IS needed. Also notice that the Anode on the LED is connected to positive. The Anode is the LONGER lead. Here’s a similar LED wiring diagram showing 4 seperate LED’s (NOT connected). Notice the load resistor that IS needed for each LED. Also notice that the Anode on the LED is connected to positive. The Anode is the LONGER lead. NOTE: If using a light up switch connect the 3rd connection on the switch to ground. Notice that NO load resistor is needed. Also notice the Anode and Cathode connections. The Anode is the LONGER lead. The LEDs MUST be connected in series, NOT in parallel.